With hundreds of billions invested in Value and Growth strategies, the popularity of these investment tilts is undeniable. And for good reason! Value and Growth strategies tend to exhibit negative correlation of excess returns, meaning that when they are combined in a portfolio, they can deliver diversification benefits. Plus, by holding positions in both strategies, investors have the tools to express their views on the market, tilting more towards growth or value in certain market regimes. So, as Growth strategies begin to look rich versus historical fundamentals, many clients are asking if it is time to take some Growth chips off the table and tilt toward Value. The issue with the binary choice between Value and Growth is that in the most general sense, both are foundationally risk-on approaches. It is no secret that the Value factor typically does well post-recession when the economy is recovering, while Growth tends to perform well during the expansion phase. However, should the economy as well as investment styles really be defined as binary? Or should investors consider investment styles beyond Value and Growth to express views in market environments beyond just recoveries and expansions? BlackRock believes that the market experiences a gradient of cycles, extending beyond recoveries and expansions to include slowdowns and contractions. In a similar manner, we believe investors should consider a gradient of factors in portfolio construction beyond simply Value and Growth as broad categories. As my colleague Andrew Ang has written, the Growth category generally represents some stocks which are priced more expensively for good reason, and some which are not. We can benefit by focusing on those aspects of growth which have been historically most rewarded: namely stocks with strong balance sheets and a robust trend. By getting specific about what we mean by Growth, investors can focus on the aspects of growth that are most attractive in today’s market environment. With these considerations in mind, I believe clients are asking the wrong question when they weigh if it is time to sell traditional growth and rotate into value. Rather, in an environment where many Growth-oriented stocks may be priced to perfection, and clients are looking to make portfolio changes, is Value necessarily the right place to turn? If your projections support an environment of economic recovery, then the answer might well be yes. If however, you believe markets are heading toward a slowdown or contraction, Value may not be the most timely investment strategy to deploy. In this latter case, seeking more resilience may be warranted. Quality investments can offer a protective middle ground between the typical Value and Growth dynamic. Quality companies generally exhibit more profitability, less leverage and stable earnings relative to their peers, making them more resilient when earnings may have peaked or an economic cycle is maturing. 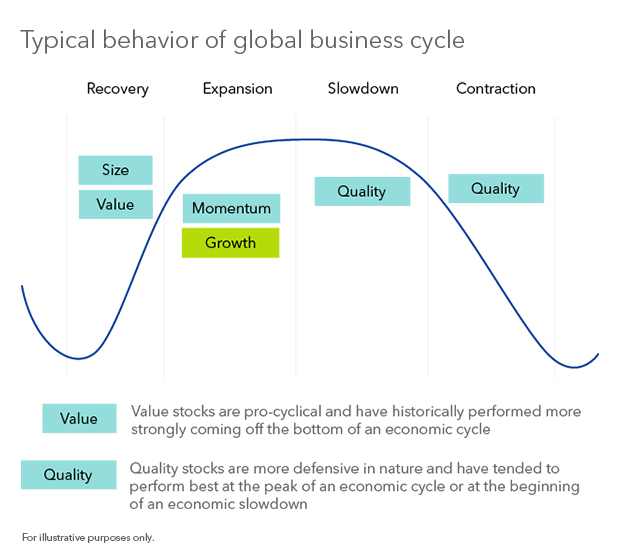 Below we see the typical behavior of a global business cycle. For investors looking to make a change in reaction to deteriorating market and economic dynamics, Quality may offer an opportunity to build more resilience into portfolios. However, while we believe altering portfolio allocations around the economic cycle can add value, timing the market is difficult even for the most experienced investor. As such, Quality, like other factors including growth-oriented Momentum and Value, can play an important role in investors’ portfolios throughout the full business cycle, delivering exposure to diversified sources of rewarded returns. When growth-oriented names appear stretched, but tilting toward Value in a volatile economic slowdown doesn’t feel quite right, where do you go? Quality companies have typically answered this question, providing a defensive equity exposure by emphasizing stocks with strong balance sheets and stable earnings. We believe incorporating Quality can help add a new, protective dimension to existing style box portfolios. Both over the full business cycle and during economic periods of slowdown and contraction, we believe Quality captures an important source of diversified and rewarded return. Thus, regardless of your investment framework, the addition of Quality can bring resilience to investment portfolios, turning a 2-dimensional decision into something more diversified and robust. Courtesy of Holly Framsted, CFA, Director, the US Head of Factor ETFs and is a regular contributor to The BlackRock Blog (more by BlackRock here). MSCI USA Value and MSCI USA Growth Indexes vs MSCI USA over the last 10 years as of 10/31/2018. including possible loss of principal. There can be no assurance that performance will be enhanced or risk will be reduced for funds that seek to provide exposure to certain quantitative investment characteristics ("factors"). Exposure to such investment factors may detract from performance in some market environments, perhaps for extended periods. In such circumstances, a fund may seek to maintain exposure to the targeted investment factors and not adjust to target different factors, which could result in losses. This material is not intended to be relied upon as a forecast, research or investment advice, and is not a recommendation, offer or solicitation to buy or sell any securities or to adopt any investment strategy. The opinions expressed are as of November 2018 and may change as subsequent conditions vary. The information and opinions contained in this post are derived from proprietary and non-proprietary sources deemed by BlackRock to be reliable, are not necessarily all-inclusive and are not guaranteed as to accuracy. As such, no warranty of accuracy or reliability is given and no responsibility arising in any other way for errors and omissions (including responsibility to any person by reason of negligence) is accepted by BlackRock, its officers, employees or agents. This post may contain “forward-looking” information that is not purely historical in nature. Such information may include, among other things, projections and forecasts. There is no guarantee that any forecasts made will come to pass. Reliance upon information in this post is at the sole discretion of the reader. Past performance is no guarantee of future results. Index performance is shown for illustrative purposes only. You cannot invest directly in an index. The iShares Funds are distributed by BlackRock Investments, LLC (together with its affiliates, “BlackRock”). ©2018 BlackRock, Inc. All rights reserved. BLACKROCK is a registered trademark of BlackRock, Inc., or its subsidiaries in the United States and elsewhere. All other marks are the property of their respective owners.